Project Perfect Mod :: View topic - combine shadow? Posted: Tue Feb 24, 2015 11:15 am Post subject: combine shadow? 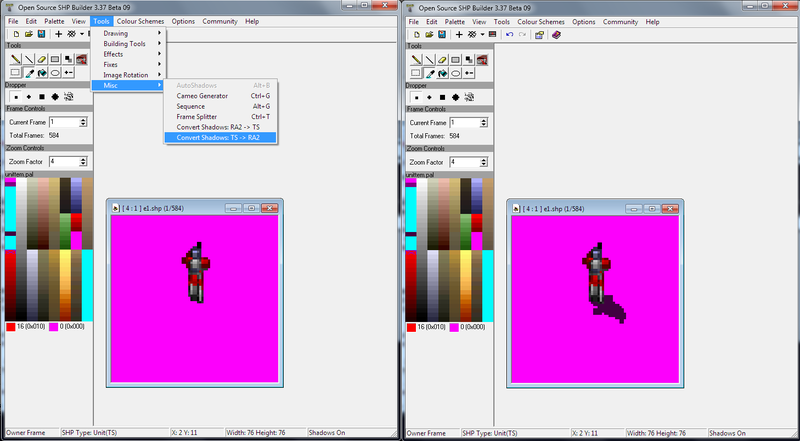 i wonder did SHP builder have "combine shadow" option to allow me combine shadow to main sprite in same frame? no, i don't think it has that. But i think XCC Mixer has it. yes mostly i combine with XCC mixer only problem is it work only with SHP(TS) while can't work with TD/Ra1 shp force me to convert my shp so many time if i want to use for those game. and some time make me confuse. What needs to be converted? What are you guys talking about? Tools->Misc->Convert shadows RA2-TS replaces shadow frame 1 to nonshadow 12 and vice versa - is that what you need? no, that's not what he wants. In TD and RA1, there were no separate shadow frames. Shadows and image are in the same frame. So the question is, If a function exists, to combine the image and corresponding shadow frame into one frame. If the shadow frame has color 1 then that script does that indeed. (shadow frames end up being empty). But try it out and tell explain me the difference, because I still don't see. That's a color replace, not a frame merge. 1 frame with colored pixel AND shadow pixel. the colored frame drawn over the shadow frame. Okay, then tell me the difference between what you talk about and what I show in this post. Because my mind is so thick. Graion is correct, that function CAN be abused to do the job as IT IS NOT just a color replace but it also copies the index 1 shadow content into basic frames as index 12. I've devised a edited pal to make this more convenient for HM to use this trick. Just tested it and i didn't noticed the black shadows on the black transparent background. Yes, that function can be then indeed used to merge the shadows into the normal frames. ok thank you everyone now my problem solve.